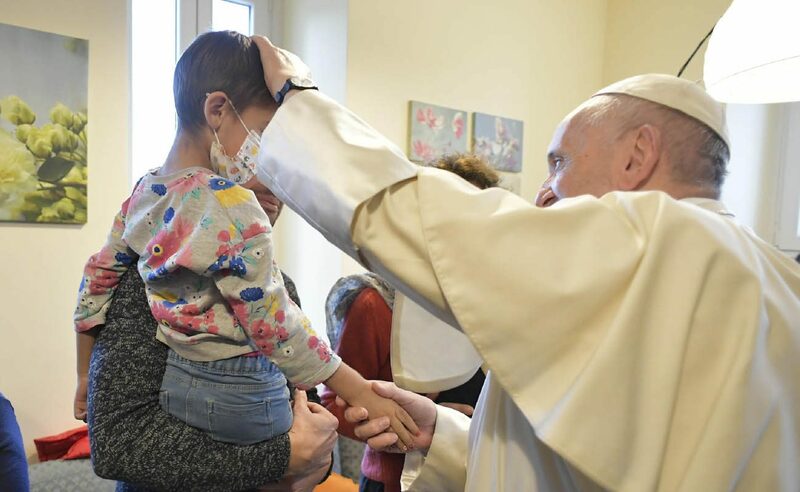 ROME (CNS) — Pope Francis made surprise visits Dec. 7 and 8 to people receiving medical care far from their homes, to a dozen intellectually challenged young people and to the staff of a major Rome newspaper. The late-afternoon visits Dec. 7 to the CasAmica residence for families with a member needing long-term medical care far from home and to Il Ponte e l’Albero, a therapeutic rehabilitation home, were part of the pope’s continuing “Mercy Friday” activities. Both the CasAmica and Il Ponte e l’Albero are on the extreme southern edge of Rome. “The pope rang the doorbell and was welcomed by the personnel on duty, who were dumbstruck at the unexpected visit,” the Vatican said. Some of the guests were in the kitchen and some children were in the playroom. “The Holy Father stopped to play and joke with them” before listening to the parents of some sick children and offering them words of comfort. The visit to Il Ponte e l’Albero came in response to a letter from some of the young people describing “the daily difficulties that come from their mental disadvantages,” as well as their desire and efforts to follow the programs their doctors have designed for them. Pope Francis stopped at the newspaper’s headquarters in the center of Rome just after leading prayers for the feast of the Immaculate Conception. In a video of the visit, posted by the newspaper, Pope Francis confirmed Il Messaggero is his preferred daily paper, even though, he said, “I’ve been advised against” reading it by some people. “I wish you the best — another 140 years,” he told the staff.